In EC rules that governs the Tibetan parliamentary and Sikyong elections, there is an option for independent candidate to run as Voluntary Chitue. However, similar option is not provided for Sikyong. In India, citizens are provided voter ID card to avail their voting rights. At the time of voting, they are not required to provide any documents to satisfy their responsibility as a citizen such as tax documents. 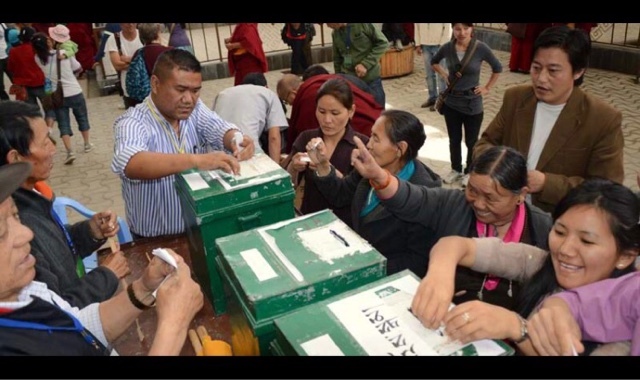 However, for Tibetans, the right to vote is tied to individual responsibility to pay their green book dues. This is a fundamental flaw in the Tibetan electoral process in particular and Tibetan democracy in general. If nothing changes, many future Tibetans in exile will turn unTibetan just because they did not pay green book dues. Local election committee and its officer should have a right to count and declare its results to their public (seems this right is provided in the EC rules). Counting of votes at one centralized location involves not only the risk but also the unnecessary high cost. For instance, Office of Tibet in Washington DC asked its local election committee/officer to send their ballot boxes to its office. If we look at the preliminary election in North America, the taped ballot boxes from its local election centers should have been voided. EC rules requires that the ballot boxes must be sealed. Moreover, who will take the responsibility if these boxes are tempered or lost in transit? After the result declaration of preliminary election by EC, there is only a couple of months for candidates to campaign as well as for the electorates to analyze and pick their right candidates. There should be more time for the public to assess their candidates. Moreover, the EC should make it mandatory for candidates to declare their campaign expenses periodically. Election Commissioners and its local commissioners should strictly enforce the set EC rules that governs the electoral process. They should keep a close watch and investigate any issues that relates to the non-adherence of any EC rules. Moreover, candidates use of His Holiness the Dalai Lama's portrait during their election campaign is a gross negligence of EC rules. At the time of filing nomination by candidates, they should be made to declare their presence in the social media network. They should be made a part of EC's own social media network to keep a watch on their activities. Moreover, if there are any other profiles or pages that identify or represent themselves as individual candidates, it should be reported to Facebook Inc. for deletion or other necessary actions. Moreover, having a social media code of conduct for candidates will be helpful to curb the outflow of negative and demeaning election campaigns. One date for Sikyong and Chitues election fails to garner the interest and debates required from the general public to identify, understand and pick their candidates for Chitues. Note: I tried to keep these seven list short, simple and easy to understand. If you need more elaboration, please feel free to leave a comment. Wrote this piece at Kacheguda railway station while waiting for my next train to Mysore.